Put simply trigonometry is the study of triangles and their properties, such as their angles and lengths and how these are related. Central to trigonometry is the right angled triangle. It is very important to know and understand the different properties of right angled triangles. Some of these you may have already encountered such as Pythagoras Theorem and area of triangles. In this chapter you will be working with trigonometric ratios, these are commonly referred to as sin, cos and tan. Here the side opposite the angle θ is the ‘opposite side’ and the side next to the angle θ is the ‘adjacent side’. 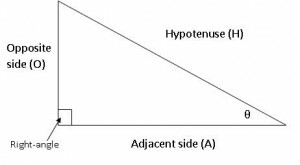 It is a common mistake to confuse these two sides, or even confuse them with the ‘hypotenuse’ which is the longest side of a right-angled triangle. 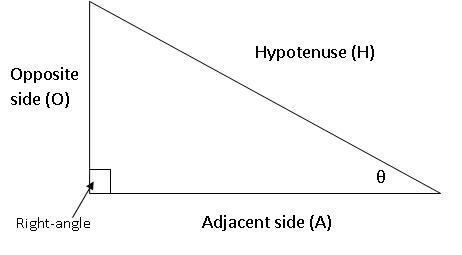 Make sure you carefully identify each of the opposite, adjacent and hypotenuse sides for a given angle before using the trigonometric ratios. A useful acronym for remembering these ratios is SOH-CAH-TOA, here S represents sine which is equal to opposite O divided by hypotenuse H (this makes SOH and the next parts correspond to cos and tan respectively).